Every concert the Grand Rapids Symphony gives in DeVos Performance Hall is planned a long time in advance. One year ago, when the orchestra prepared the program for this week’s concerts, it was a natural fit to give the world premiere of a piece of music inspired by the fall harvest just before Thanksgiving. On the other hand, recent events such as the outcome of November’s Election, which left half the country elated and the other half in mourning, could not have been foreseen. Yet by happenstance, the Grand Rapids Symphony this week had at the ready two major works of music to match the mood of the day. The first, a heartfelt plea for peace; the second, a sunny symphony seasoned with hope. To top it all off, Music Director Laureate David Lockington returned for his first appearance on the Richard and Helen DeVos Classical Series since he stepped down from his post as music director 18 months ago in May 2015. An audience of 1,117 welcomed Lockington on to the stage with cheers as well as applause and treated the Grand Rapids Symphony to three standing ovations on Friday. 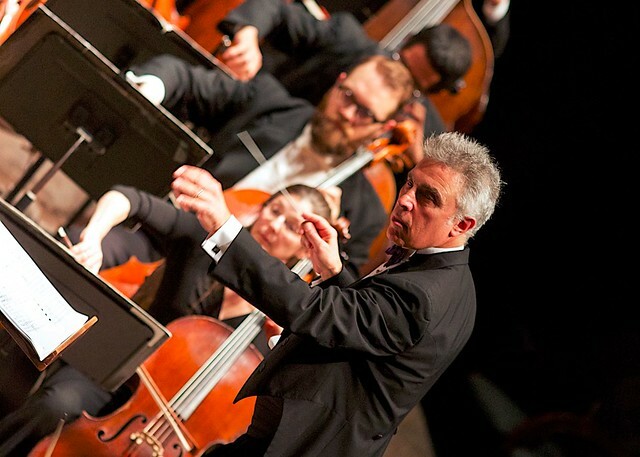 The Classical Series concert repeats at 8 p.m. Saturday, Nov. 19. The Grand Rapids Symphony Chorus and soloists joined the orchestra for Ralph Vaughan Williams’ Dona Nobis Pacem or “Grant Us Peace,” an anti-war cantata premiered in the fall of 1936 as the rise of National Socialism began to spread across Europe. Using texts from the Bible, from the Latin Mass, from a political speech about the Crimean War, and from the poetry of Walt Whitman, it’s a plea for peace that the English composer came by honestly. Though he was 42 years old when World War I broke out in 1914, Whitman volunteered for military service in the Royal Army Medical Corps as an ambulance driver. It’s an uncommonly beautiful piece of music. But it’s also a solemn, sober work that pulls no punches. Friday’s performance was marvelous nonetheless. The work is very much a journey. So many disparate texts make it a challenging journey that must be carefully held together. But Lockington, who spent 16 years leading the orchestra, knows how to get the job done. What’s more, he has a talent for working with singers, and chorus director Pearl Shangkuan supplied a well-rehearsed choral ensemble equal to the task. That’s important because the soloists offer commentary and reflection, but the chorus bears the brunt of carrying the musical argument forward. Whitman’s text, “Beat! beat! drums!” came complete with fire and brimstone. Carrie Hennessey’s haunting soprano set the stage for the work, and her voice projected both vulnerability and strength on Friday. Leon Williams’ introspective baritone, even when serving as the impersonal narrator, was captivating just the same. The finale was a rollercoaster of emotions, and the piece ends with a final, whispered plea, “Dona Nobis Pacem.” But the chorus had plenty of opportunity to roar as well. In the fourth section, when the chorus sings, “I hear the great drums pounding,” it’s likely people out on Monroe Avenue heard it as well. Antonin Dvořák’s Symphony No. 6 is overshadowed by the next three symphonies he wrote, including his Symphony No. 9 From the New World. But his Sixth Symphony was his breakthrough work that elevated him from the status of rising regional artist to international recognition as one of the finest composers of his day. It’s a nice work to show off an orchestra as well. Lockington led an exciting performance of warmth and geniality that led the audience to break into applause at the end of the first movement. The adagio was as delicate as chamber music. The lusty scherzo, a Bohemian dance rhythm known as a “Furiant,” grabbed the audience by the lapels and gave it a good shake. Lockington’s deft handling of the elaborate contrapuntal interaction in the fourth movement helped demonstrate why so many solo bows were needed. The music director laureate ran a tight ship and it paid off. The program opened with Gathering Sunset, by Assistant Principal Cellist Jeremy Crosmer, a five-year member of the Grand Rapids Symphony. Crosmer’s second commissioned work for the orchestra, a tuneful, melodic piece, could easily be the music for the opening of a movie. The 7-minute overture, commissioned by George H. and Barbara Gordon, was inspired by a painting titled “Gathering Pumpkins at Sunset” by Grand Rapids’ own second generation impressionist, Mathias Alten. A sunset, when you think about it, is majestic. Crosmer’s music faithfully captures one particular sunset on one particular day. Low brass portrays farmers harvesting the final crops of fall with winter just around the corner. Winds and strings describe the changing light in the sky, late in the day, as an orange-yellow sun slowly sets beneath the horizon, leaving a trail of greens, blues and purples in its wake. You can see the 1907 painting for yourself in the Gordon Art Gallery at Grand Valley State University downtown. Or you can come to DeVos Hall and hear the painting performed by the Grand Rapids Symphony.